On to a new project! I've got so many projects I want to do and so little time these days. Here is the newest project. I'm tatting an edge for a friend of my mother. She had several hankies in storage and wanted to give them to me. It seems her mother did crochet edges and never used these hankies. I asked her to pick one for me to take and 'regift' her. Here is the hanky and the beginning of an edge. I chose an edge from Mary Konior's book, "Tatting with Visual Patterns". I think this is the bride's maids pattern. I'll have to check again and let you know if it's different. As you see, I've got a long way to go. One note...I really like the edging patterns which help you visualize the corners. Now, I just hope this will repeat 'just right' and fit the hanky I've got. On another note, I would love to be able to respond to your wonderful comments but have been unable to do so.... I've tried everything. So, I'm at a loss on that one. I will tell you, I'm really looking forward to TAT days this September. I hope your weekend is grand! Well, well, well... The long awaited booties have arrived. These things would like to have been my demise. However, I am finished. I need your input. Here is the finished project. I changed the 'upper' on the toe. Rather than closing the toe with the round 'florette', I decided to try and create a laced version. You can see I tatted rings and joined the chains to the previous round. This was all done in hopes that the booties could be put onto the baby's foot a little easier and on different sized feet. I hope the pictures show what I've done. Your feedback is welcomed! Pride comes before the.....What the heck was I thinking?!?! There I was...so proud of my accomplishment. I finished the next row on the tiny little booty. Calm, content, and at peace with myself. I HAD EVEN FINISHED THE ENDS! As I sat and prepared to start the same row on the second booty I suddenly thought...OMG... John, did it ever occur to you to read the directions CAREFULLY?! And now, the two together. REALLY?! It's been awhile since I tatted this pattern....but, REALLY?! Tatting is still restful and peaceful for me (I keep telling myself this)...I just find it difficult to sit in my chair in the summer when there is so much to be doing outside. Does anyone know a good therapist? (for those that don't know...that's what I do) I think it's my turn for the breathing exercises. So, I just looked an found that my last post was May 22nd. An unbelievable lapse in time. 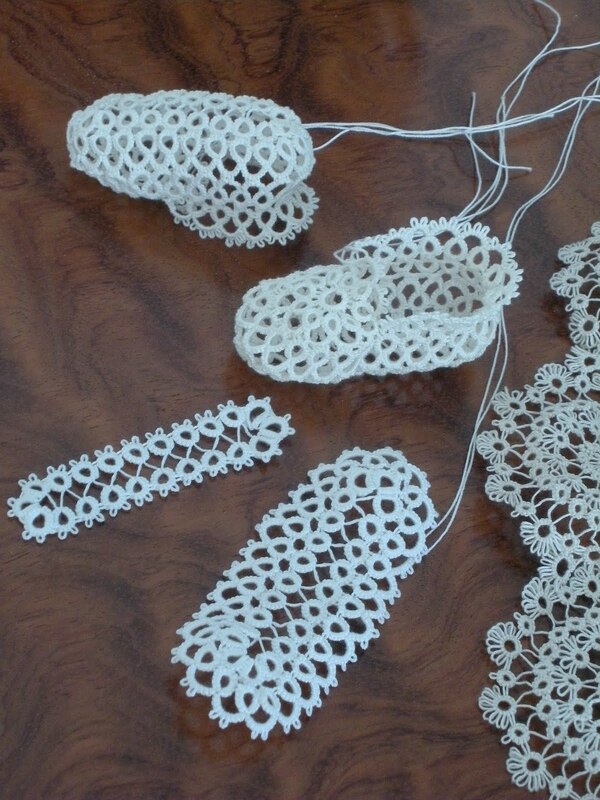 Summer gets in the way of my social networking.... Actually, I've been tatting, just on some of the same projects ya'll have seen before. I've been working to complete several sets of the tatted motifs for cleric stoles and now have two complete sets. Recently, I've been working on baby booties again. This time, as usual, one of my coworkers is having a baby and I would love to gift her a pair of booties. Many of you have seen these before coming from me. So, please forgive me if you have...but I wanted to stay in touch and let you see the progress. I'm trying to figure out how to increase the size of the pattern. Therefore, I've added two rings in the first round hoping to first increase the length and maybe the finished width. We'll see how much this adds to the final size. Other than tatting, my family and I went on our annual camping/hiking trip during the month of June. It was an amazing time. Sometimes I think we camp not necessarily for the moment...rather, we camp for the memories. The storms, the poison ivy, no phone, no lights, no motor cars..... But we always end up reminiscing and laughing (alot!). 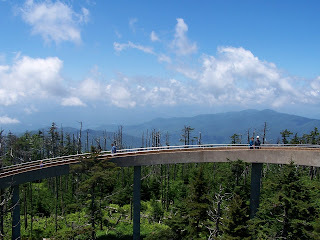 We went to the Smokey Mountain National park this year and had a wonderful week filled with many memories. 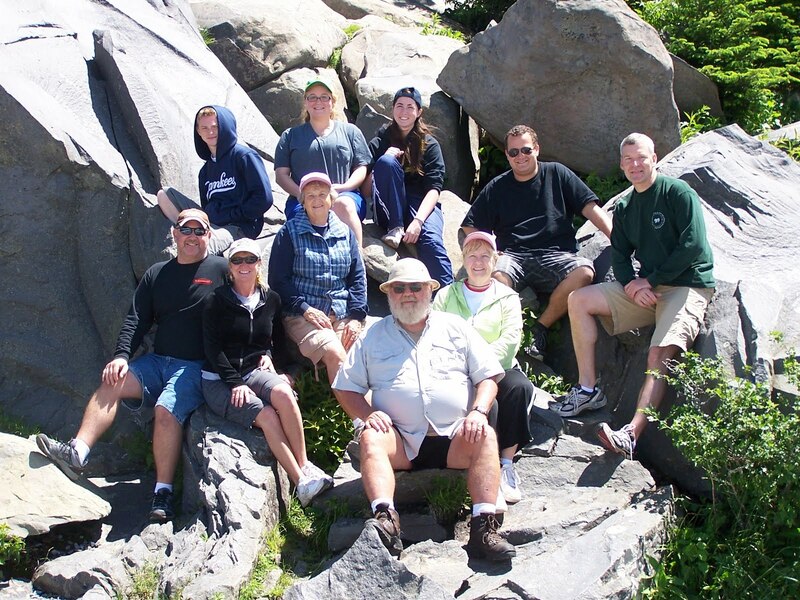 This photo was on our last day, just before we left (and after a night of storms). 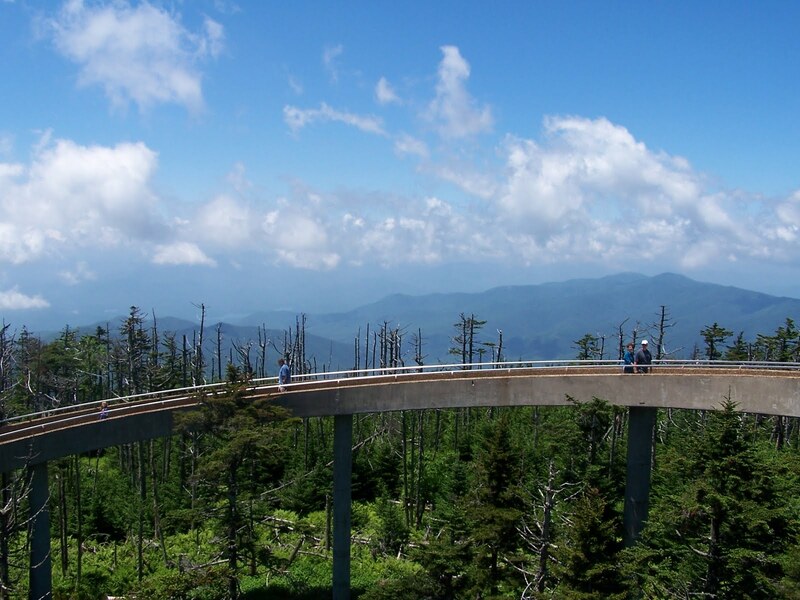 We visited Clingman's Dome just to see the wonderful panorama. And here is the family. I got everyone to settle for just a minute as we invited innocent passers by to take our photo. Just like herding cats. We had alot of fun.